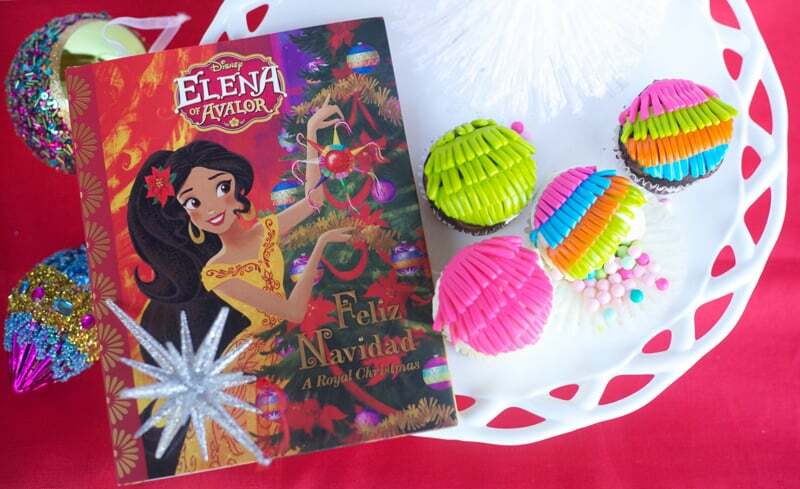 We are loving Elena of Avalor: Feliz Navidad! 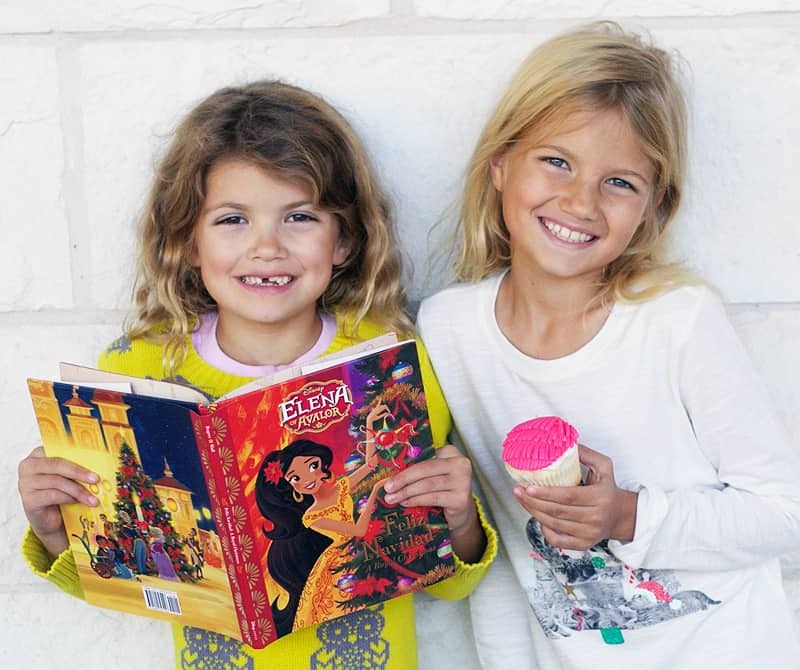 In partnership with Disney Books, we were asked to come up with a fun sweet treat that celebrates the beautiful Latin and Hispanic-inspired culture featured in this special holiday book. 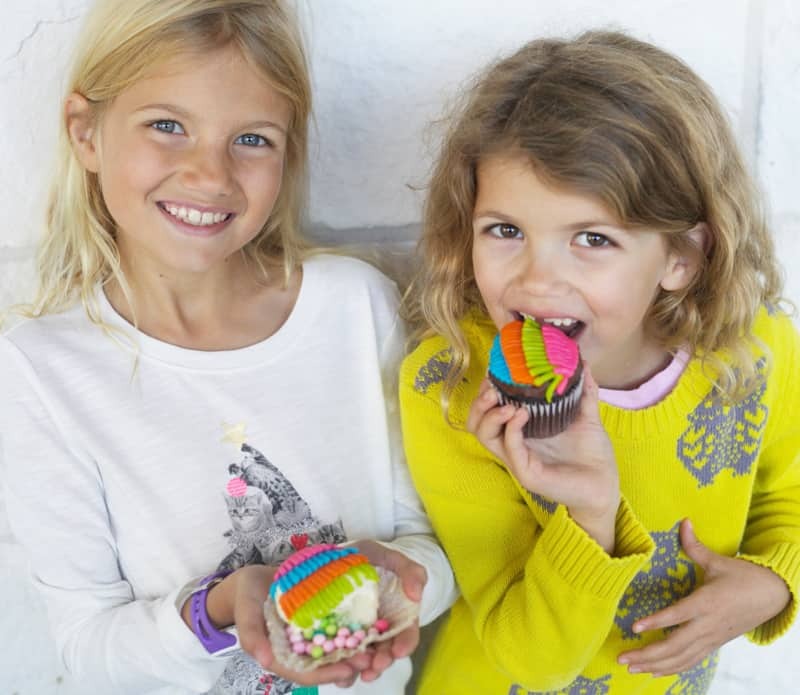 We came up with these easy and adorable cupcakes with a surprise inside. 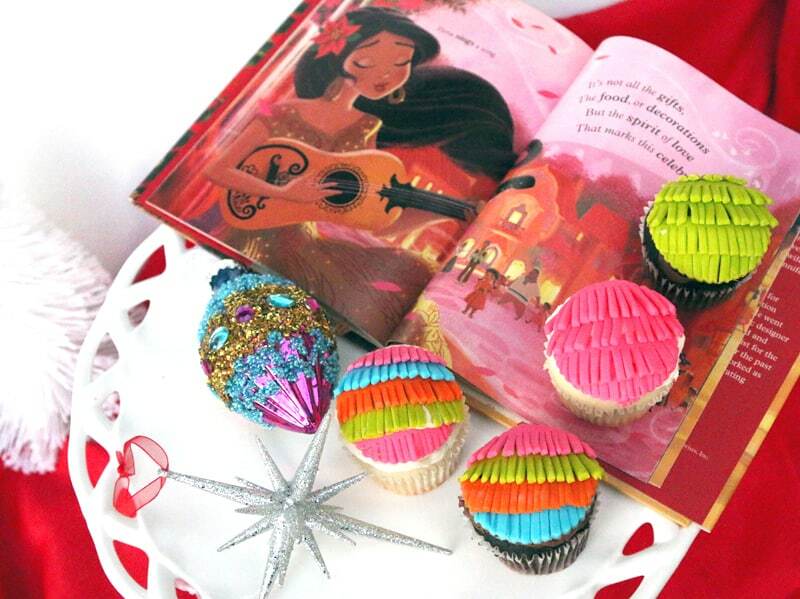 The Piñata Cupcake! 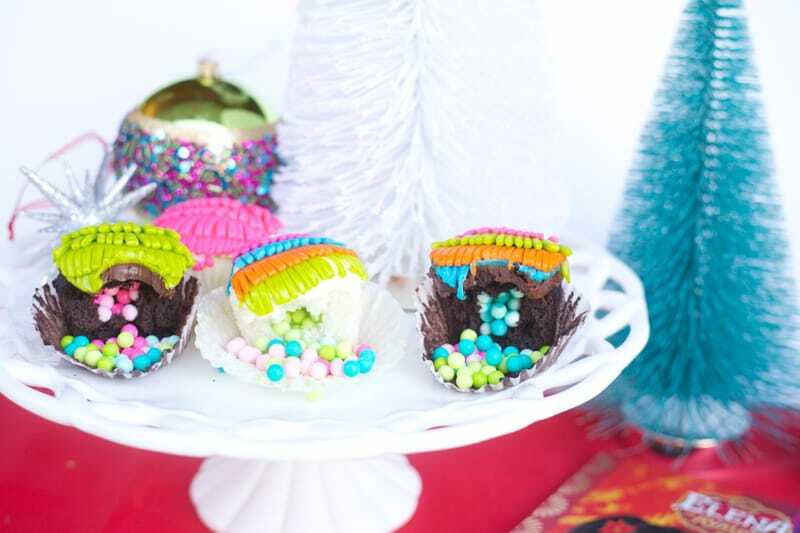 Here’s every detail that you need to prepare this festive treat! When your cupcakes are completely cool (or purchased un-frosted from the bakery) use the huller to cut a “core” out of the center of the cupcake. 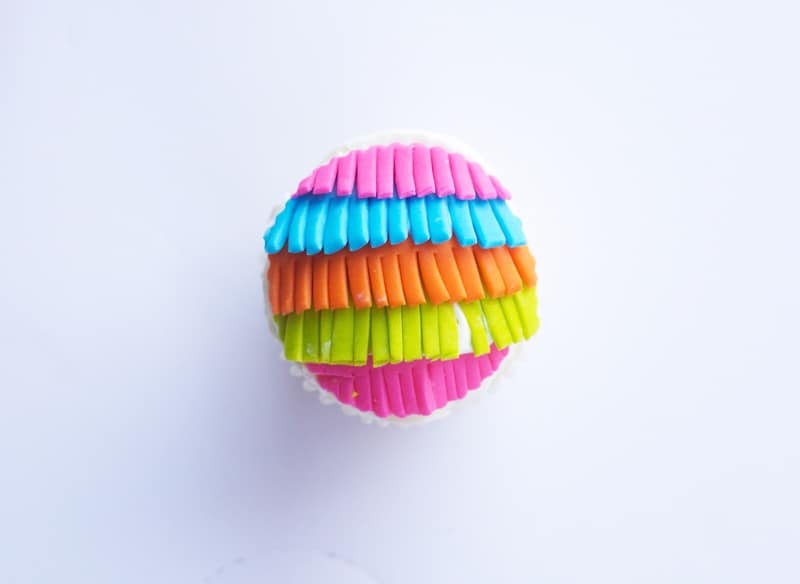 Go about 2/3 of the way town into the cupcake and set aside the “core.” Fill the cupcake with candy that is moisture resistant. You can push it in a little bit. 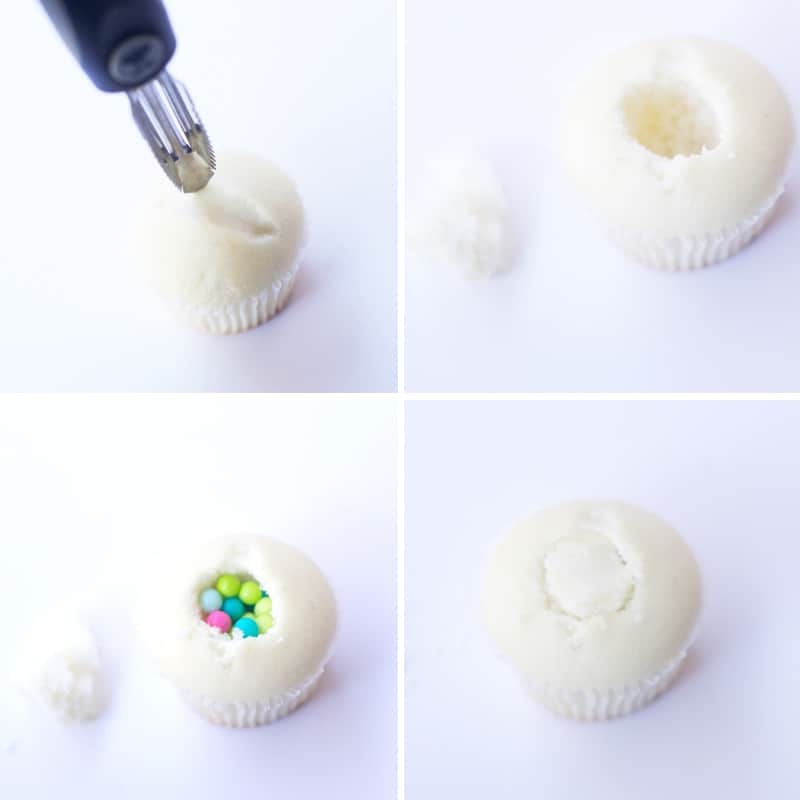 Remove the bottom of the “core” and press the top back in place on the cupcake. If you have spaces, or the core breaks, you can cheat by just piecing the cake together on the top. It will be covered by frosting. Set your cupcakes aside. We used a selection of pre-made neon fondant. 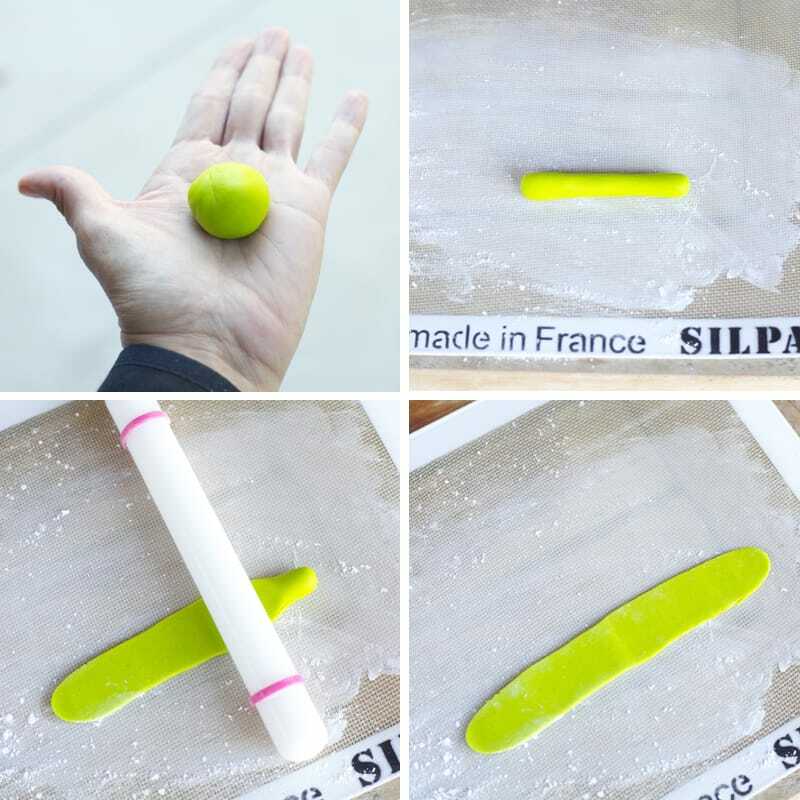 Once you have your fondant prepared, break off a ball about 1″ wide. Knead the dough with clean hands until pliable and form into a ball. Roll the ball into a log. On a clean surface (counter or Silpat) lightly dusted with powdered sugar (with a power sugar coated rolling pin) roll the log into a flat strip, as thin as you can work with. Cut the bottom long edge straight or press flat with a straight edge. 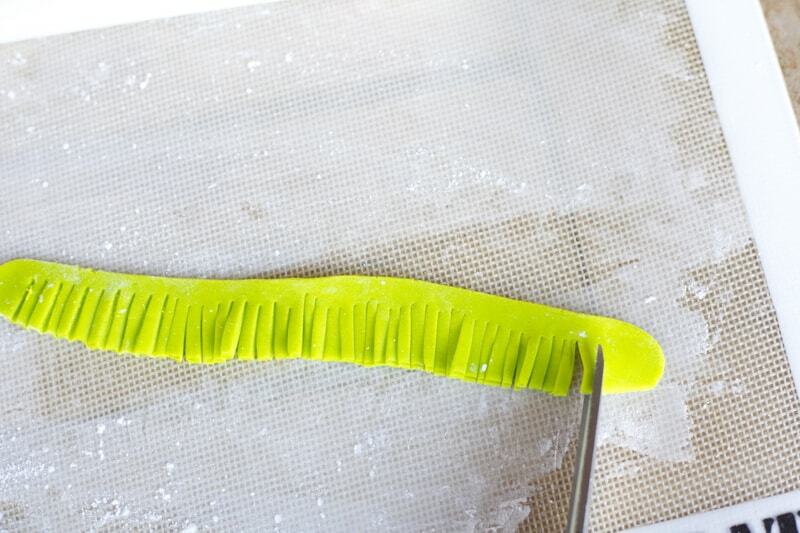 Use clean kitchen scissors to snip fringe in the bottom edge of the strip. 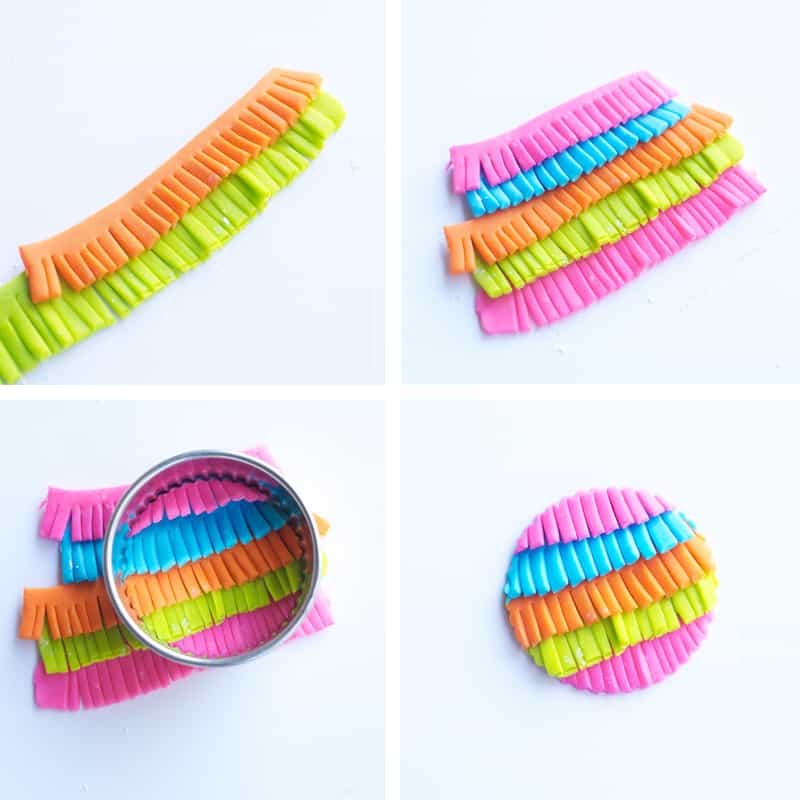 Continue adding layers of fringe. Use a damp finger or paper towel along the top of the strip to help the layers stick together. Not too much water. 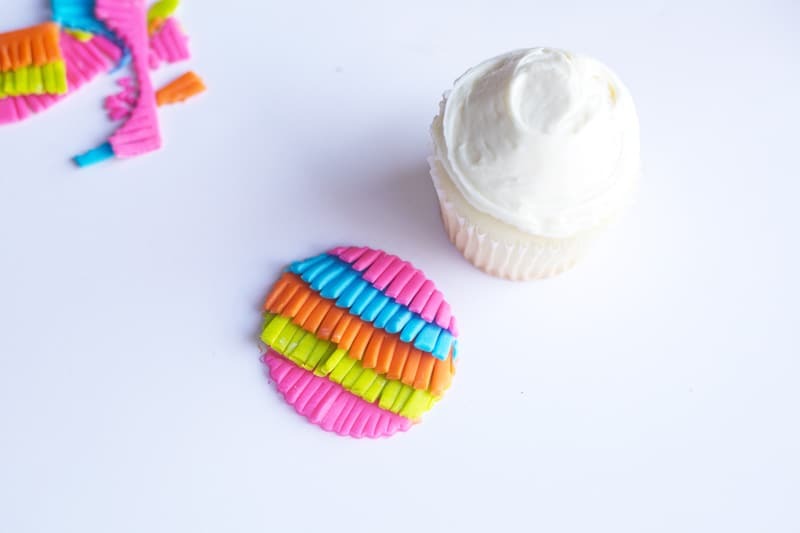 Cut the entire piece with a round cookie cutter, or use a template and cut with a knife. The cookie cutter really helps here. 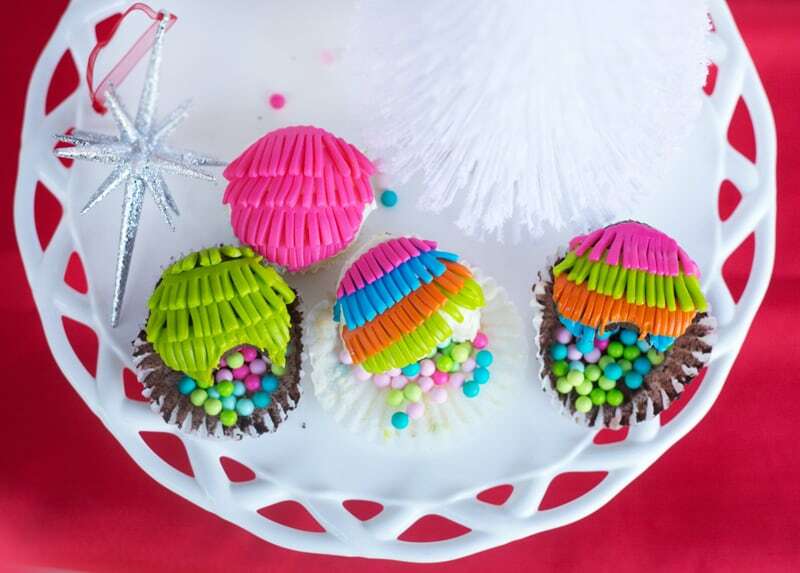 Frost your cupcakes with a generous mount of your favorite cupcake frosting. 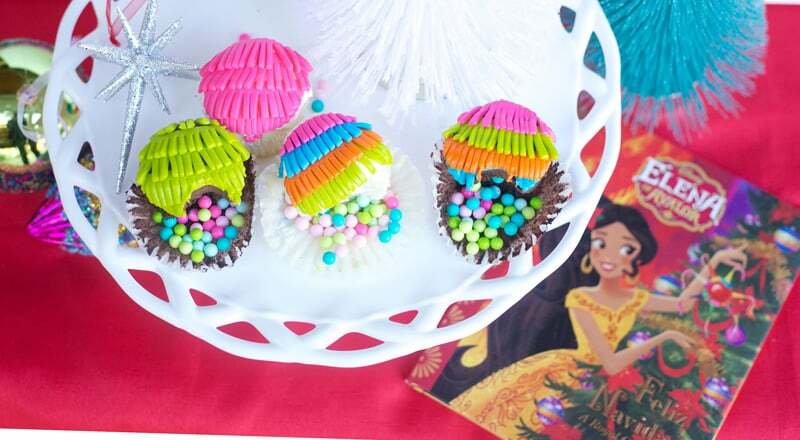 Carefully use a small spatula or knife to lift the fringe onto the cupcake and press lightly to set in place. If you press too hard, some frosting will peek through. oops! You can carefully reposition fringe with a knife if you want. Isn’t that fairly easy and so pretty? And as Elena learned in the end… It’s not all the gifts, The food or decorations, But the spirit of dessert, that marks this celebration. Wait, not dessert, it’s LOVE! My mistake. 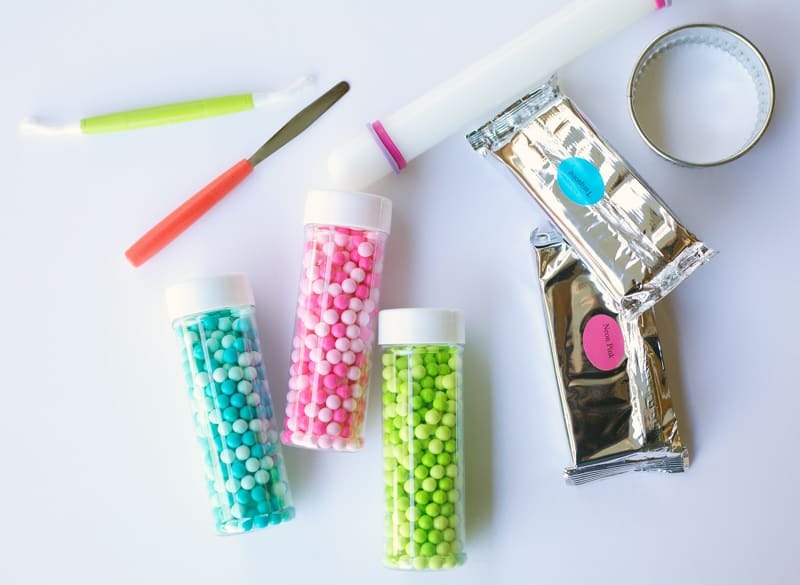 Take a big bite and watch pretty candy spill out just like a piñata! It’s so much fun. 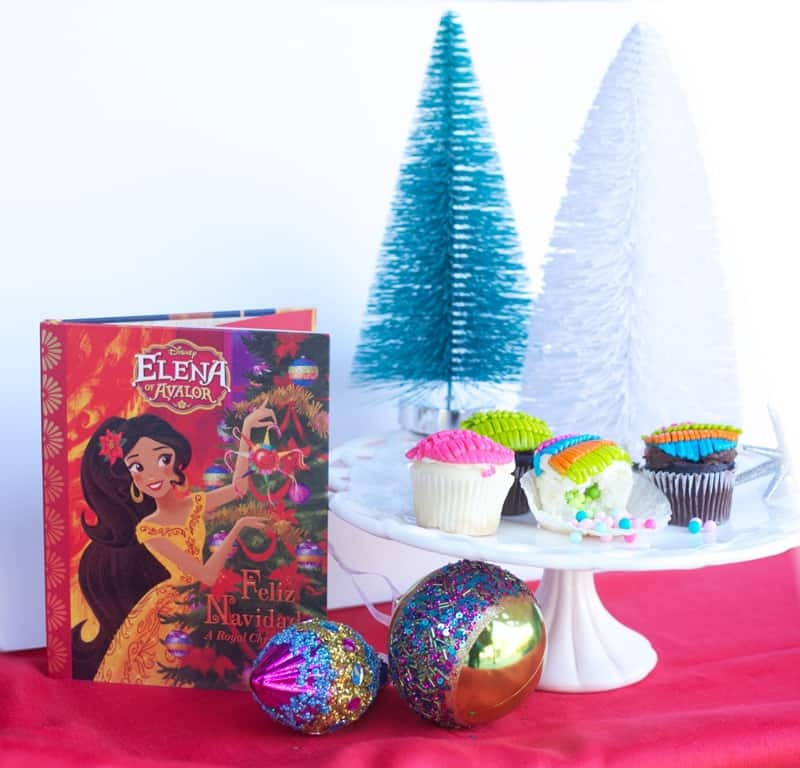 In Elena of Avalor: Feliz Navidad, Elena decides to host one big Navidad celebration in the park so that everyone can celebrate together. But each community is more interested in proving that their traditions are the best. Can Elena help her subjects see what the holidays are really about? I won’t give away the ending but Elena shows that she is learning to be a thoughtful, resilient and compassionate leader. Love that girl! In partnership with Disney Books. What a creative and fun idea. Love it! !